NETWORK FINALS: The 10PM episode of 48 HOURS rose 0.1 in final numbers. CABLE HIGHLIGHTS: It was an extremely quiet cable Saturday on Memorial Day weekend. HBO’s STORKS wasn’t an original, but a theatrical movie premiere (and its 0.30 wasn’t all that great even in that category), so the real original programming leader of the night was HGTV, which had 3 shows in the Top 10: BEACHFRONT BARGAIN HUNTERS at 0.29, and a pair of late-night episodes of WE BOUGHT THE FARM at 0.28/0.27. ID’s FATAL VOWS gained 0.05 to 0.26. Fox News had 2 hours of its morning FOX & FRIENDS in the Top 10 at matching 0.22s. 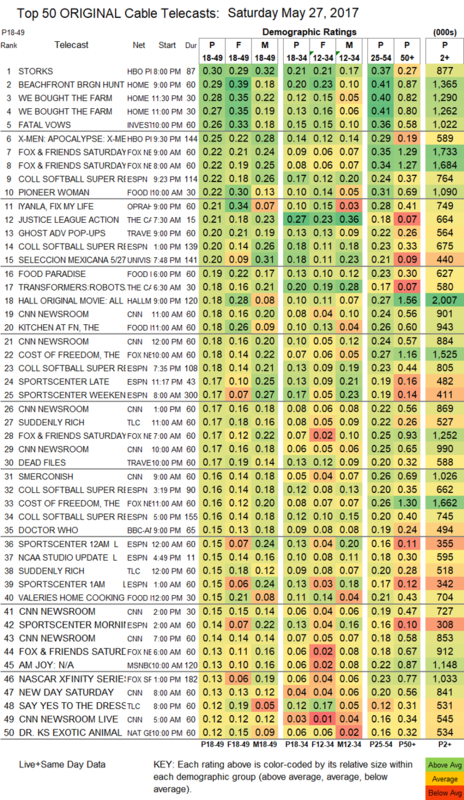 ESPN’s primetime coverage of COLLEGE SOFTBALL was at 0.22 (other games were at 0.20/0.18/0.16/0.16). Food Network’s PIONEER WOMAN lost 0.03 to 0.22, KITCHEN AT FN dropped 0.03 to 0.18, and VALERIE’S HOME COOKING was at 0.15. On OWN, IVANYA FIX MY LIFE stayed at 0.21, and THE BOOK OF JOHN GRAY was down 0.04 to 0.11. Hallmark’s original movie ALL FOR LOVE was at 0.18. On BBCAmerica, DOCTOR WHO fell 0.03 to 0.15, while CLASS ticked up to 0.06.